Nestled in the penthouse of the Thea Koerner House on the north side of campus is Seedlings, a café from the people who brought you Sprouts. If you haven’t heard of Sprouts, it’s a student-run organization that provides affordable food locally- and ethically-sourced in BC and Washington state, including the UBC Farm. Spouts’ original location in the Nest is not expected to open until later this winter. Seedlings serves $1 tea or coffee and a variety of $4 vegan specialties such as a bowls, stews, salads and even breakfast food. But perhaps best of all, they have kombucha on tap! 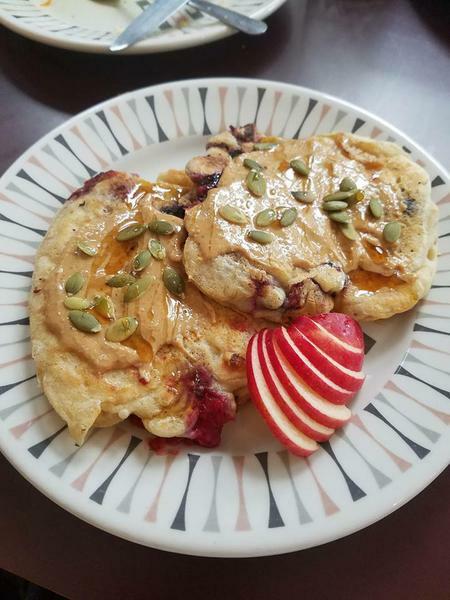 For less than $15 dollars, a friend and I shared a plate of vegan pancakes and a falafel curry bowl — each well-portioned and scrumptious — as well as enough kombucha to keep our guts riddled with benevolent flora for the next month. But I’d be negligent if I didn’t mention Seedlings’s feel-good, eclectic atmosphere. Its furniture and dishware are all donated or cheaply sourced. The eating area is also spacious with floor-length windows and balconies on each side. Seedlings is open Monday through Friday from 9:30 a.m. to 4 p.m. If you find yourself strolling by the Rose Garden and craving a sustainable snack, give Seedlings a try!